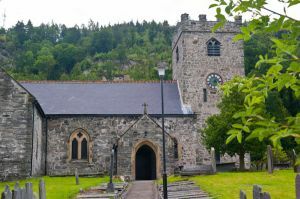 Corwen church dates to the 13th century and though it was heavily restored in the Victorian period, it has several intriguing historic features which make it worth a visit - though most of these are best seen from outside. 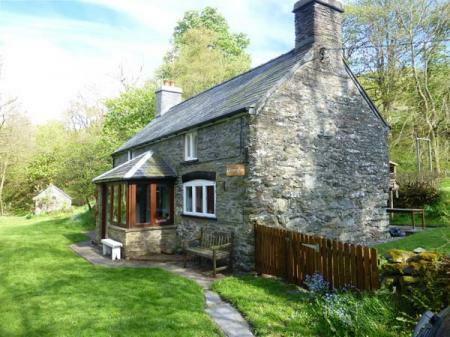 On the east wall of the entrance porch is an ancient standing stone, whose name in Welsh translates loosely as 'the pointed stone in the icy corner'. The presence of the stone may indicate that the site was used as a place of worship, or at least as a gathering place, long before the coming of Christianity. Walk around the west end of the church and you will see a tall late Saxon preaching cross set on a broad stone base. This cross, somewhat reminiscent of the Pillar of Eliseg near Llangollen, is topped with a much worn squared head decorated with interlace patterns. The cross is thought to date to the 9th century. Carry on around the south (rear) of the churchyard until you come to the south-east porch. Look inside the iron bars and you will see an ancient stone lintel over the arch. On the lintel is a carving that the town guide calls a cross, but I thought it actually resembled a dagger more than a cross! Local folklore says that this cross was caused when Owain Glyndwr threw his knife in rage from his seat atop the hill of Pen y Pigyn above the church. Now look behind the church and you will see an old medieval building, originally built to house priests, but later rebuilt as almshouses for the widows of clergymen. There is one final historic feature to see, and this time it is inside the church. At the west end is a very simple Saxon font, thought to date to the 9th century. Nearby is a very worn wooden chest carved from a single piece of oak.